NETWORK FINALS: Local college basketball tournament adjustments weren’t kind to the networks. BLUE BLOODS fell 0.2 in final numbers, while AGENTS OF SHIELD, TAKEN, and CONFRONTING PUTIN all lost 0.1. CABLE HIGHLIGHTS: But what was bad for the broadcasters was good for ESPN, which had games from the ACC TOURNAMENT at 1.11/0.23, the BIG 12 TOURNAMENT at 0.41/0.23, and the SEC TOURNAMENT at 0.34/0.26. Discovery’s GOLD RUSH was at 0.76/0.46, compared to last week’s 0.71/0.38. 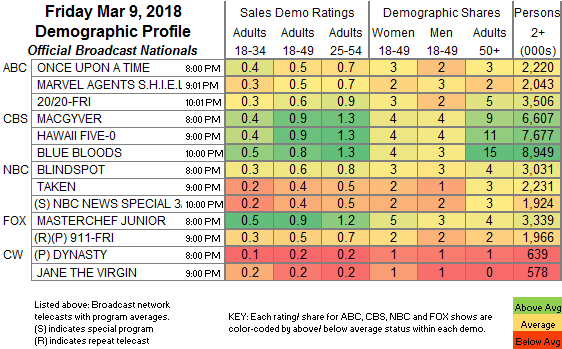 A&E’s LIVE PD gained 0.08 to 0.65. On HBO, REAL TIME WITH BILL MAHER ticked up to 0.41, and HIGH MAINTENANCE ticked up to 0.10. HGTV’s MY LOTTERY DREAM HOUSE rose 0.05 to 0.34, HOUSE HUNTERS edged up 0.02 to 0.30, and HOUSE HUNTERS INTL was up 0.05 to 0.28. MSNBC’s RACHEL MADDOW SHOW topped cable news at 0.32/0.47/2.8M, above Fox News’s HANNITY at 0.22/0.41/2.6M and CNN’s CNN TONIGHT at 0.21/0.29/800K. Nickelodeon’s 6PM LOUD HOUSE was at #13 with 0.32, and lead-outs SPONGEBOB and ALVIN & THE CHIPMUNKS were respectively at 0.28 and 0.21. 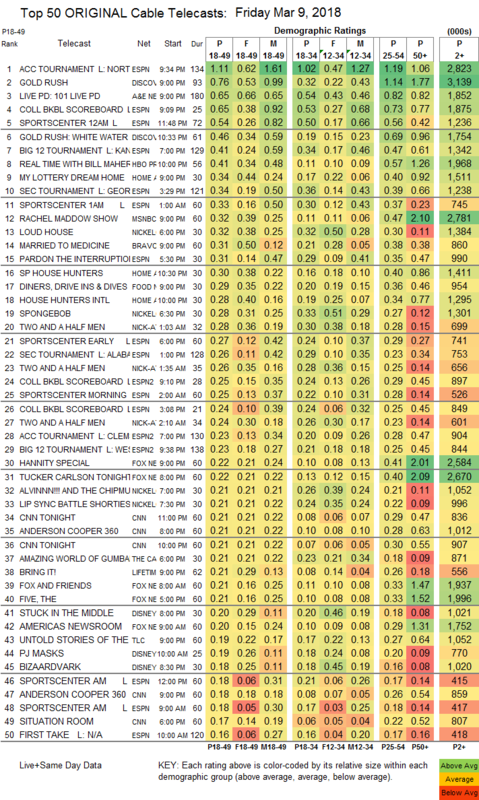 Bravo’s MARRIED TO MEDICINE rose 0.03 to 0.31, and RELATIVE SUCCESS was up a tick to 0.12. Food Network’s DINERS’ DRIVE-INS & DIVES climbed 0.06 to 0.29. Lifetime’s BRING IT ticked up to 0.21. We’s MARRIAGE BOOT CAMP was at 0.15, and BRIDEZILLAS was down 0.03 to 0.11.